After a year-long and heroic struggle, GW Professor of Physics and Department Chair, Barry Berman, died July 20, 2010. 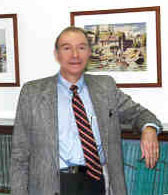 Professor Berman joined the Physics Department in the Fall of 1985. At the time, he was already a highly respected and accomplished physicist, having made ground-breaking studies of the atomic nuclei. At his first presentation at GW on his research, we recognized a brilliant mind and a first-rate teacher. We later learned he was also a forceful champion for the whole science endeavor. He was elected Chairman of the Physics Department in 1993, serving six years, and again served in 2007 and from 2009. He was elected Columbian Professor of the Natural and Mathematical Sciences in 1998. Professor Berman received his BA from Harvard in 1957, and his PhD in 1963 from the University of Illinois, in the field of experimental nuclear physics. From 1963 to 1985, he worked at the Lawrence Livermore National Laboratory, held numerous visiting positions, and was often a guest scientist at the Los Alamos National Laboratory in New Mexico. He was elected a Fellow of the American Physical Society in 1972. He was author or co-author on 244 refereed publications in physics, 430 papers in total. Given his intellectual capacities and love of ideas in physics, it comes as no surprise to see the range of topics to which he contributed (and received funding support): Medium- and high-energy nuclear physics, including photonuclear reactions, and electron, proton, and pion scattering, especially on few-body nuclei; including neutron-induced reactions, nuclear fission, nuclear resonance fluorescence, relativistic heavy-ion reactions, nuclear astrophysics; atomic and solid-state collision and coherent-radiation phenomena, including channeling radiation, transition radiation, and coherent bremsstrahlung; applications of nuclear, atomic, and radiation physics to problems in lunar geology, radiation shielding, medical diagnostics and cancer radiotherapy, radiobiology, materials characterization, substance identification, nuclear nonproliferation, and radiological and nuclear threat reduction. He was an accomplished musician, could recite long poems and lyrics, and taught a popular course on the physics of music. He was in his office on the Friday before his death, even with evident physical weakness, enthusiastically meeting his nuclear physics group, and working to the end. He devoted himself to physics and to leading the Physics Department toward the highest achievements possible. With his perception, experience, and judgment, he knew what was needed to tease secrets out of nature, and to inspire others to do so. In his valiant causes, his impatience in the face of barriers was tempered with sincere humanity. That is why his friends found him so endearing.